The decline of manufacturing jobs in the US has been the focus of much attention recently, with rising trade with China cited as one explanation. This column describes how the German economy has experienced a similar secular decline in manufacturing and rising service employment, but that growing trade with China and Eastern Europe did not speed up this trend. In fact, rising exports to the new markets have stabilised industry jobs. There has been much interest recently in the decline of manufacturing in the US. Although the share in real output has been roughly constant since the 1960s, the share in aggregate employment has been constantly decreasing over time. A popular explanation for this pattern is labour-saving technological progress (Rodrik 2016), but a recent literature argues that rising trade with China has also contributed to the US manufacturing decline, especially after 2000 (Autor et al. 2013, 2016, Pierce and Schott 2016). That conclusion may, however, be specific for the US case, given the large and persistent trade deficit vis-à-vis China (Krugman 2016). In this column we focus on Germany, which has a traditional focus on manufacturing and runs an overall current account surplus with relatively closed trade balances towards China and emerging economies in Eastern Europe. We investigate broad sectoral employment trends in the German economy (1993-2014), the underlying labour transitions at the micro-level that were behind those aggregate trends, and how this micro anatomy of structural change was affected by globalisation. Figure 1 provides some background on the German labour market. The solid black line depicts all regular jobs subject to social security from 1993 to 2014. Coming out of the post-reunification boom, there was first a long stagnation period where Germany was often labelled “the sick man of Europe”. This changed after 2005, where the country entered a phase of robust positive employment growth that was even largely unaffected by the great recession (Dustmann et al. 2014). Some important compositional shifts occurred during those 21 years. The green and the red solid lines illustrate employment growth in the service and the manufacturing sector, respectively. Services are on a secular upward trend, while manufacturing jobs declined mainly during the first decade (from around 8.1 million to 6.4 million). But parallel to this overlying expansion of services there were also marked changes inside manufacturing. The dotted and the broken lines show that industries with strong increases in net import-exposure from China and Eastern Europe declined much faster than export-oriented manufacturing. The number of jobs in the latter industries is, in fact, roughly stable since 1997 (at around 4.9 million), while job losses in import-competing manufacturing industries continued even after 2005. Note: Total number of full- and part-time workers subject to social security (excluding “mini-jobs”) in different sectors, normalised by respective base year value (1993=1). Individual labour market transitions: How do sectoral employment trends happen? In a recent paper, we being by documenting which labour market transitions at the individual worker-level are behind those broad sectoral trends (Dauth et al. 2017). For our analysis we use administrative data from the Institute of Employment Research (IAB) that cover the universe of all workers in Germany subject to social security. Data for the former East Germany is available from 1993 onwards, which sets the starting point of our analysis and coincides with the period where the economic rise of China and Eastern Europe gained momentum. Table 1 reports average annual flows between different labour market states. To construct this table, we added for every year all workers who are employed in t, in (t - 1), or both. On average, these are roughly 29.22 million persons per year. The bold figures are the absolute number of workers (in 1000s) for every possible flow, and in italics we report shares (in percent) by origin and destination. This transition matrix has to be read as follows. The first line shows that 12,747 million persons worked in the service sector in the representative origin year. Of those, 10,870 million (85.3%) still work in services the next year, some 135,000 (1.1%) moved to export-manufacturing, and so on. 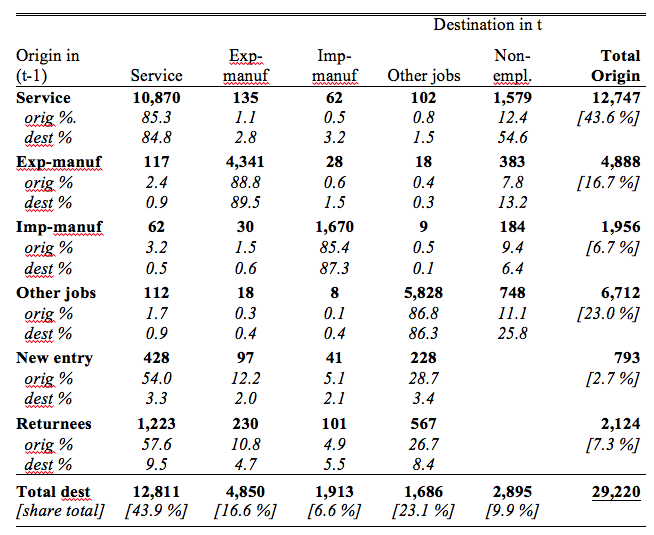 Analogously, the first column shows that, of the 12,811 million service employees in the destination year, 1,223 million (9.5%) are returnees from non-employment, 428,000 (3.3%) were new labour market entrants, and so on. Notes: Absolute numbers in 1000s in bold, row and column percentages below. New entrants are employed in t but not in (t-1), and never appear before in IAB data since 1978. Returnees are not employed in (t-1), but are employed in t and in at least one previous year since 1978. Non-employed have worked in (t-1) but not in t. This includes permanent exits and workers who return to jobs in later years. This transition matrix conveys several novel facts about the underlying micro anatomy of sectoral employment trends in the German economy. First, observe that sectoral mobility appears to be anything but smooth. The vast majority of employed workers remains on a job in the original sector. But conditional on leaving, the probability to move into non-employment is in all cases higher than for a direct and smooth transition into a different sector the next year. Second, the gross flows between import- and export-manufacturing are substantially smaller than the gross flows towards services.1 But a surprising insight is that the corresponding net flows are essentially zero (62-62) for import-manufacturing, and even negative (117-135) for export-manufacturing. Hence, the aggregate rise of the service sector observed in Figure 1 does not come from workers who directly switch out of manufacturing without undergoing an unemployment spell. This aggregate sectoral trend comes solely from young labour market entrants and returnees out of non-employment. Those groups have a 54-58% probability of starting in services, which is substantially larger than the average service employment share.2 Moreover, conditional on (re-)entering manufacturing, the chance of starting in export-oriented industries is more than twice as large as for import-competing ones. Summing up, the first part of our analysis shows that the aggregate shift from manufacturing to services does not happen smoothly at the micro level. We find little evidence that the rise of the service economy comes from incumbent manufacturing workers who directly switch jobs. The rise is, instead, entirely driven by young entrants who exhibit different sectoral entry behaviours than previous generations, and by returnees out of non-employment who take up jobs in different industries than their previous ones. In the second part, we then study the causal impact of trade on those important labour market transitions for the new labour market entrants and the returnees from non-employment. We start with an analysis at the industry-level and compute the change in the (log) number of new entrants and returnees out of non-employment into manufacturing industry j over the period 1994-2014. This we regress on industry-level net export exposure and some further controls. Since those (re-)entry flows may also be affected by unobserved industry shocks, we follow the seminal paper by Autor et al. (2013) and use third-country trade flows of other high-income countries vis-à-vis China and Eastern Europe as an instrument. Our findings suggest that both the new entrants and the returnees are systematically pulled into more export-oriented branches. The differences in entry probabilities into export- and import-manufacturing reported in Table 1 are, therefore, at least partly driven by rising exposure to international trade, and do not only reflect unobserved differential industry trends. This industry-level analysis conditions on (re-)entry into manufacturing. Hence, it does not yet allow us to infer how trade has affected the sectoral worker flows at large, i.e. whether it has fuelled or slowed down the overall manufacturing decline. To address this question, we also explore (re-)entry patterns across German local labour markets. The idea here is that all regions are similarly exposed to certain aggregate technology trends, which drive the expansion of services. 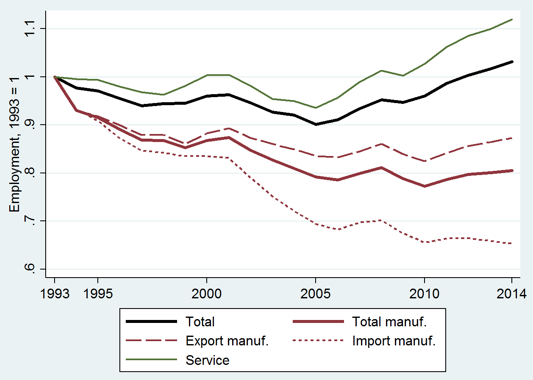 They differ, however, in their local specialisation patterns within the manufacturing sector, and thus in their exposures to export and import shocks. This regional variation is informative to gauge the total effect of trade on manufacturing employment when inter-regional adjustments through migration are sluggish, and most adjustments take place at the local level between industries (Autor et al. 2016, Dauth et al. 2014). More specifically, we compute the change in the local manufacturing shares of new labour market entrants over the 1994-2014 period across 402 German local labour markets (analogously for the returnees out of non-employment), and regress those changes in manufacturing (re-)entry shares a measure for local trade exposure and some further regional controls. The estimation results show that an increase in local net export exposure by €1,000 raises the local manufacturing share for new labour market entrants by almost 0.29 percentage points, and for returnees by 0.56 percentage points. To translate this into economically meaningful magnitudes, we conduct a back-of-the-envelope calculation of how the transition probabilities for entrants and returnees in Table 1 would have looked had the rise of China and Eastern Europe never happened. From here we project the aggregate employment composition holding the growth of total employment constant. This exercise implies that the long-run growth rate of manufacturing jobs would have been between 1.58 and 3.11 percentage points lower via the (re-)entry channel. In other words, as of 2014, Germany would have between 128,000 and 259,000 fewer manufacturing jobs without the rising trade exposure from China and Eastern Europe. Those jobs would, instead, be in services (or the public/agricultural sector), because entrants and returnees would not have been pulled by the rising net export opportunities. The German economy faces a trend of structural transformation with a secular decline of manufacturing and rising service employment due to an aggregate technology trend. The same is true in many other high-income countries. Yet, unlike in the case of the US, rising trade with emerging low-wage countries (like China or Eastern Europe) did not speed up this trend in Germany. Trade, in fact, slowed it down because rising exports to the new markets stabilised industry jobs. Our analysis is consistent with the intuition of Paul Krugman (2016) that rising trade with China contributed to the decline of US manufacturing employment only because of the extremely large and persistent US current account deficit. In a surplus country like Germany, trade did not lead to a net destruction of industry jobs. It triggered notable compositional shifts within manufacturing, both at the industry and at the regional level, but on balance it retained those jobs in the economy. Put differently, the expansion of services in Germany would have been even larger without the rising net export exposure from China and Eastern Europe. Autor, D, D Dorn and G H Hanson (2013), “The China Syndrome: Local Labor Market Effects of Import Competition in the United States”, American Economic Review 103: 2121–68. Dauth, W, S Findeisen and J Suedekum (2017), “Trade and Manufacturing Jobs in Germany”, American Economic Review, Papers & Proceedings 107(5). Dauth, Wolfgang, Findeisen, Sebastian and Jens Suedekum (2014) “The Rise of the East and the Far East: German Labor Markets and Trade Integration” Journal of the European Economic Association 12(6): 1643–1675. Dustmann, C, B Bernd, U Schönberg and ASpitz-Oener (2014), “From Sick Man of Europe to Economic Superstar: Germany’s Resurgent Economy”, Journal of Economic Perspectives 28(1): 167–188. Krugman, Paul (2016), “Trade and Jobs – A Note”, New York Times, 3 July. Rodrik, D (2016), “Premature Deindustrialization”, Journal of Economic Growth 21(1): 1–33. At the sectoral level, we distinguish some 93 (3-digit) manufacturing, 84 service, and 37 other (agricultural and public) industries. For 93 manufacturing industries we can then merge trade volumes from the United Nations’ Comtrade database. Export-industries are those with above-median, and import-industries those with below-median net export exposure with respect to China and some 21 countries in Eastern Europe, with industry-level trade exposure defined by the 1994-2014 change in Germany’s total net export volume to that area divided by the aggregate wage bill in the base year to account for industry size (see Dauth et al. 2017). Analogously, entrants and returnees account for larger shares of service employment than direct switchers from import- or export-manufacturing (3.3% and 9.5% versus 0.5% and 0.9%).